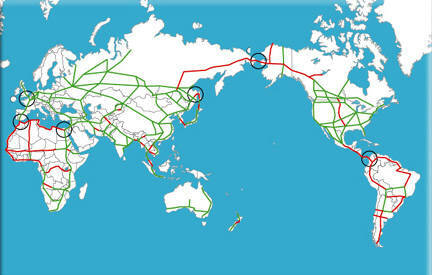 Main routes of the World Land-Bridge. Existing routes are green, proposed routes are red, but the existing routes need improvement. 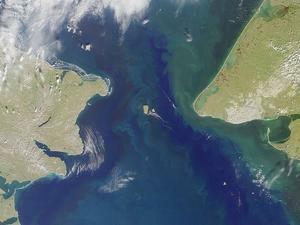 Officials are questioning the feasibility of a proposal by the Russian government to build a 64-mile long tunnel under the Bering Strait that would connect Siberia and Alaska. “Russian officials insist that the tunnel is an economic idea whose time has now come and that it could be ready within ten years. They argue that it would repay construction costs by stimulating up to 100 million tons of freight traffic each year, as well as supplying oil, gas and electricity from Siberia to the US and Canada,” reported The Times Online. 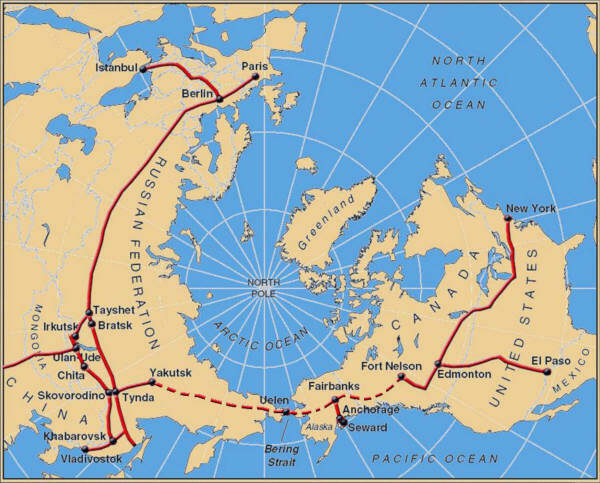 The Bering Strait tunnel would be also be used for a high-speed railway line and to house a fiber-optic cable network between the countries. This mega-project is expected to cost $65 billion. Levinthal said the tunnel would be an extension of a 500-mile rail line that is currently being built that will link Yakutsk to the Trans-Siberian railway, reports MSNBC. 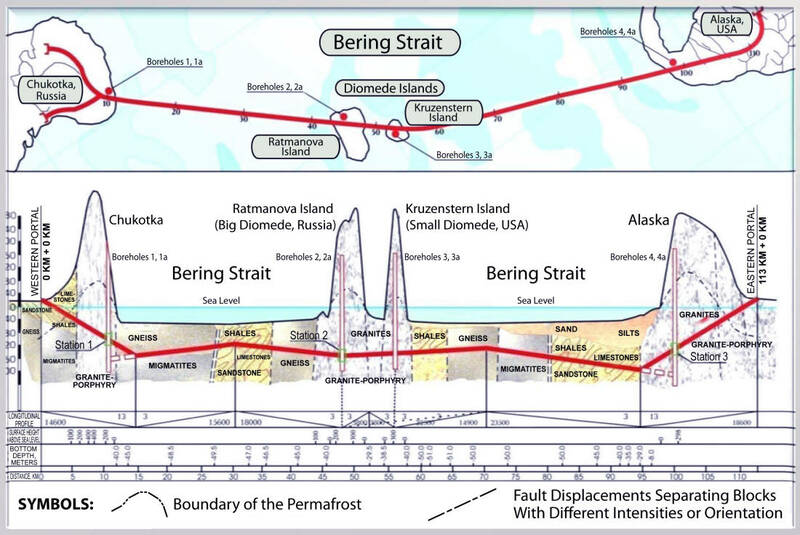 Renewed by the recent support of the Russian government, plans are underway to build the tunnel, which would “pass underneath the Big Diomede and Little Diomede islands and straddle the international dateline to link East and West,” said the Daily Mail. The Russian officials plans to submit a proposal to the United States government in the coming weeks asking for assistance in underwriting the construction of the tunnel in exchange for a share of the revenue it will produce. 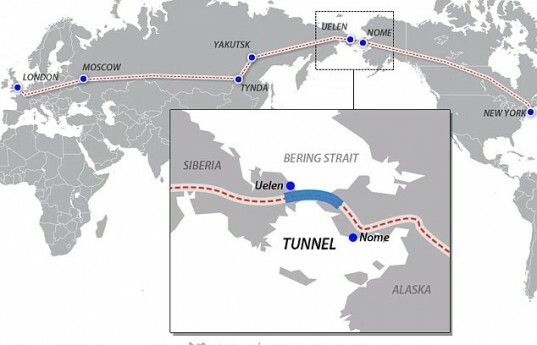 A tunnel between the two countries could save the US and Russia $20 billion per year in electric costs, says supporters of the project, but it would require the US government to build railway lines from Canada to the Bering Strait to connect the tunnel with the rest of North America.